Five women, all senior citizens, gathered for a photo on a pier outside a waterfront restaurant in Beaufort, North Carolina, on the evening of May 11. Without warning, the pier collapsed, plunging them all into Taylor’s Creek eight feet below. Surrounded by oyster beds and wooden pilings, the women clung to the collapsed structure in water too deep for them to stand. Among the five lifelong friends, Kay Cochron of Albemarle was the greatest cause for concern. She’d suffered heart problems in the past, and the others began to panic as they treaded water and worked together to keep her afloat. An off-duty Coast Guardsman, Fireman James D. Sanders, Jr., of Wedowee, Alabama, was eating dinner with his girlfriend at the same restaurant, and witnessed the alarming event. Without hesitation, he sprung into action. Amid the horrified onlookers and the dazed group of women in the water, Sanders remained a force of calm. 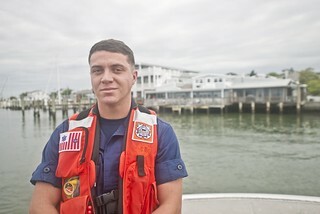 With just eight months in the U.S. Coast Guard at Station Fort Macon, North Carolina, Sanders reacted to the situation like a seasoned first responder. Sanders yelled for onlookers to grab whatever floatation devices they could find and spoke with reassurance to the women. Keeping them huddled together, Sanders spotted a dock about 35 feet away. “Luckily, the current wasn’t too bad at this particular time so I was able to keep them huddled around the woman with heart issues to keep her warm,” said Sanders. Sanders’s request for floatation was answered when some pool noodles were located and passed down. Sanders retrieved the floating noodles and slid one under each woman. A good Samaritan arrived with a kayak to help. Sanders organized the transfer of the women, one by one, to safety on the nearby dock. By the time the Beaufort Fire Department arrived on scene, two women had already been escorted out of the water. When Cochron finally made it to the pier, she was too shocked to turn around and thank him. Later on, however, she would voice her gratitude. “He was a blessing to us,” said Cochron. For the women, it was more than luck and circumstance, but Sanders’ swift reaction to a dire situation, and clear thinking to organize the efforts of other good Samaritans that evening. Sanders hopes to become an aviation maintenance technician and eventually get qualified as a flight mechanic – a person responsible for operating a helicopter hoist in emergency situations. Based on his recent life-saving actions, he’ll likely do well under that kind of pressure. Tags:Coast Guard Station Fort Macon · Fireman James D. Sanders Jr.